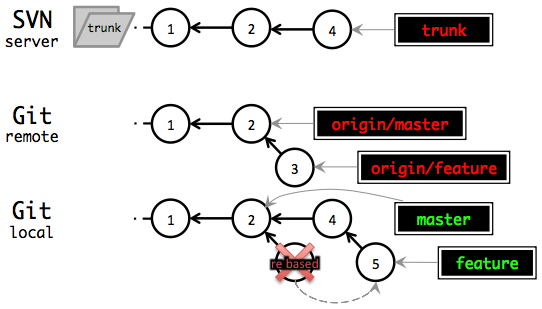 The constant we must maintain between the SVN and Git repository is: The Git repository’s master branch should always be equivalent to the SVN trunk, commit for commit. To start, let’s assume we have an existing SVN repository called project. On your local machine, clone the newly initialized Git repository (again, in this example, just another file location on my local machine). Writing objects: 100% (8/8), 699 bytes | 0 bytes/s, done. Git remote master is now in sync with SVN trunk, commit for commit. However, if a commit is made to trunk or master, it must be manually synced to the Git or SVN repository, respectively. That’s what the next sections will go over. 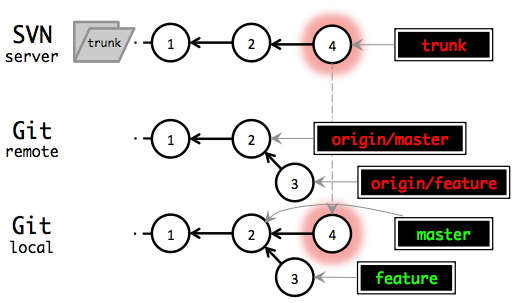 Now that the remote Git master is in sync with SVN trunk, let’s go through the steps as if we don’t have a local Git repository, i.e., the perspective of your teammates. Fortunately, these steps are similar to the initial setup, but they must be followed each time the remote Git repository is cloned. 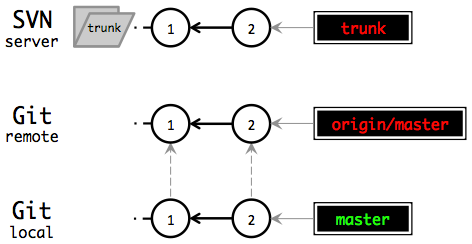 If master and trunk point to different commits, likely one of the git svn init steps was done incorrectly. We’re now ready to enjoy the fruits of our labor. From here, create a feature branch off of master (or any other SVN branch) push it to remote, and from there follow whatever Git workflow you and your team agree upon. The only qualification is that, before putting changes back on master/trunk, all branches must be merged, rebased, or otherwise accounted for. This is because the entire feature branch will be rebased to the tip of master/trunk during this process. 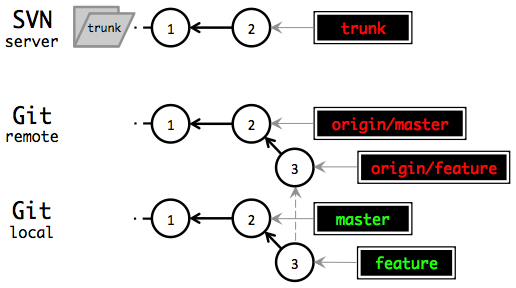 For simplicity, let’s assume that no commits have been made to master/trunk (we’ll go over that detail below). Let’s also assume that our feature branch has one commit (it could also be a series of commits, as long as the history is linear). This situation is depicted below. First, check that master/trunk is up to date. Of course, there was no new history (as per our assumptions), but we did it anyway because it’s a good habit. Next, push the feature branch from local to SVN. Note that the dcommit command rebased the feature branch. This is why it’s important that anyone else working off of the feature branch has already committed and pushed their changes, and any branches off of the feature branch are carefully rebased after this process. 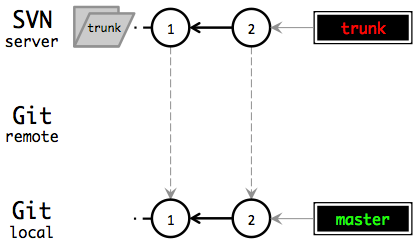 We must keep trunk and master in sync, so the next step is to merge master and push to origin. Writing objects: 100% (3/3), 417 bytes | 0 bytes/s, done. Finally, the feature branch should be deleted. Deleted branch feature (was 1e8f83e). This is the most common scenario you’re likely to run into. Suppose you’re about to merge a new feature back to master/trunk. As always, you first call git pull origin master and git svn fetch. Writing objects: 100% (6/6), 664 bytes | 0 bytes/s, done. Deleted branch feature (was b16c5f9). You must always call git svn fetch before calling git svn docommit. If you do not, extra commits will be added to trunk, and your history will be messed up. 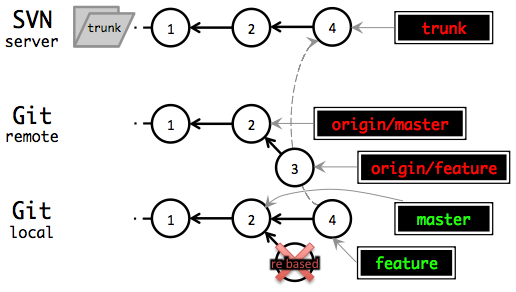 If the SVN repository has branches or tags, they can be handled the same way trunk is handled. Git svn can be used to create branches, but I wouldn’t recommend using this feature. Git cannot merge SVN branches, so do not merge sync’ed SVN branches in Git. The name master and trunk are just conventions. With an authoritative SVN repository and subserviant Git repository, it might be more clear to use the branch name trunk instead of master.